Reimaged SPA with new image through GUI and CLI. I also noticed SPA took a lot longer to come back online after restart and if I restart SPB and therefore fail the services over to SPA, Unisphere was not responding and only when SPB came back online, it started to function correctly. In the end, EMC accepted it may be a hardware fault and replaced SPA. 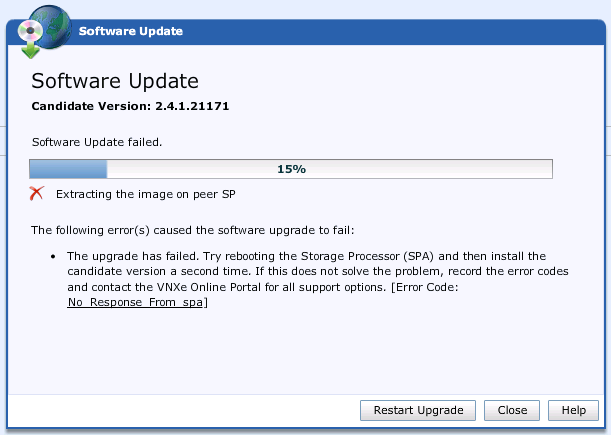 Unfortunately, even after we replaced SPA, VNXe upgrade did not finish successfully but this time it failed at 41% which was a good indication we were on the right track. /dev/sda2             5.0G  4.3G  401M  92% / =======> 8% of free space WILL NOT be enough! Storage integrity verified successfully. All storage elements appear to be healthy. INFO: Peer SP found - attempting to run on both SPs. Now searching for files that could be deleted on SPA ...Done! A total of 1130MB can be saved on this system by removing files. Cleared 1130MB of space off of SPA root filesystem! user can analyze the findings. /dev/sda2             5.0G  3.2G  1.6G  68% / ======> 1.6 GB or 32% is free! /dev/sda2             5.0G  2.9G  1.9G  61% / ======> That's much better! /dev/sda2             5.0G  2.7G  2.1G  57% / ======> Even better! A total of 9MB can be saved on this system by removing files.